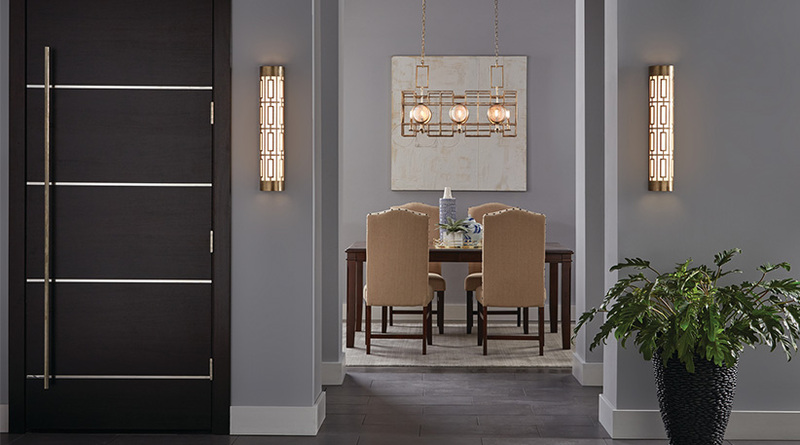 Dining room lighting should be both beautiful and functional. This can be accomplished using a mix of ambient, task and accent lighting. These various layers of light establish the mood for a variety of functions, including dining, homework or family bookkeeping. Dimming controls will enable you to vary the light for each function. A chandelier is often the focal point of a dining room. Suspended over the dining table, it serves as a decorative element that enhances the beauty of your fine furnishings. When the light is dimmed, a soft, glowing atmosphere similar to candlelight is created. If equipped with a down-light, the chandelier provides task lighting for the table and accent lighting for a centerpiece. Choose a chandelier that is 6" narrower than the smallest width of the dining table. If your table is 48" x 72", then the recommended width of the fixture is approximately 36". The chandelier should hang approximately 30" above the tabletop in an 8' ceiling. For each additional foot of ceiling height, add one inch. In a 10' ceiling, the chandelier should hang approximately 32" above the table. Track lighting provides ambient lighting, while enabling you to highlight prized possessions throughout the room. A row of four recessed downlights around the dining table supplements the light from the downlights while providing accent lighting for your tableware. A buffet or sideboard can be accented with recessed downlights in the ceiling above installed 24" to 36" apart and 9" to 12" inches from the wall. Installed in the ceiling or under cabinets, recessed downlights can be used anywhere in the home and are ideal for any type of ceiling, including tall ceilings, short ceilings and sloped ceilings.